To find out more about Warwickshire County Golf Union click on the logo. 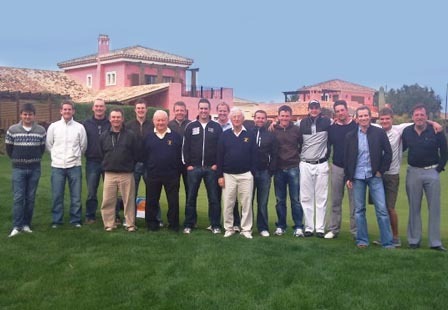 Two PGA Instructors and one official accompanied ten players from Warwickshire County Golf Union aged between 18 - 44 years for 4-days of warm weather pre-season winter training at the Desert Springs Resort between 23rd – 27th February. The Warwickshire Union of Golf Clubs was founded in 1906, and represents 49 clubs within the County, providing knowledge and expertise to support them all. The Warwickshire Union identifies existing talent and through its coaching program develops the next generation of Golfers to represent the County and beyond at a National Level. “We have had a great time. Desert Springs is a fantastic venue for both practicing and playing. The facilities are superb and it’s a great place to start your season off with. “Desert Springs is a great place for teams to practice, the facilities are great and the food is excellent. The players and officials were accommodated in some of the privately owned apartments normally reserved for holidays and short breaks at Desert Springs and the resort’s executive chef was on hand to cater for the special dietary requirements of individual players dining each evening in the ‘El Torrente’ Restaurant. For further information on Warwickshire County Golf Union visit their official website. Warwickshire County Golf Union, based in Stratford upon Avon, England, has selected the Desert Springs Resort to host their winter training camp. Between Tuesday 23rd - Saturday 27th February, Desert Springs will be host to ten (10) players and three (3) professional staff from Warwickshire County Golf Union for a four-day intensive training programme to develop their individual golfing skills in warm weather, utilising the excellent practice facilities at the Golf Academy and playing the Championship Indiana course. During the training camp, players can enjoy opportunities to swim, play football and tennis and use the gymnasium, trim trail, jogging tracks, paddle tennis and beach volley ball courts. They also have access to the resort’s Private Reserve which incorporates a spa, private sauna and jacuzzi suite, personal fitness workout room, games room with bar, and a home cinema. Accommodation for the players and officials is in some of the privately owned apartments normally reserved for holidays and short breaks at Desert Springs Resort. The resort’s executive chef will be on hand to cater for the special dietary requirements of individual players dining in the resort’s award-winning El Torrente Restaurant. Warwickshire County Union selected The Desert Springs Resort and Golf Club to host its warm weather Winter Training Camp from the 2nd to the 7th of March 2010 for its first team squad. "The overall experience has been very enjoyable. The golf course and practice facilities were excellent and always in fantastic condition. The staff were very friendly and amenable at all times, making the whole experience enjoyable. We will definitely recommend Desert Springs to others on our return to the UK and we will be returning ourselves, bringing other parties here for golf tours!"